Adding just a little bit more to this post. I am the very fortunate finder of a vintage many painted stool with layers of paint all naturally worn with red, yellow, blue, pink and even some white showing through in various layers and areas. I had previously edited this picture using Picnik but FRIDAY March 9th PicMonkey was released. 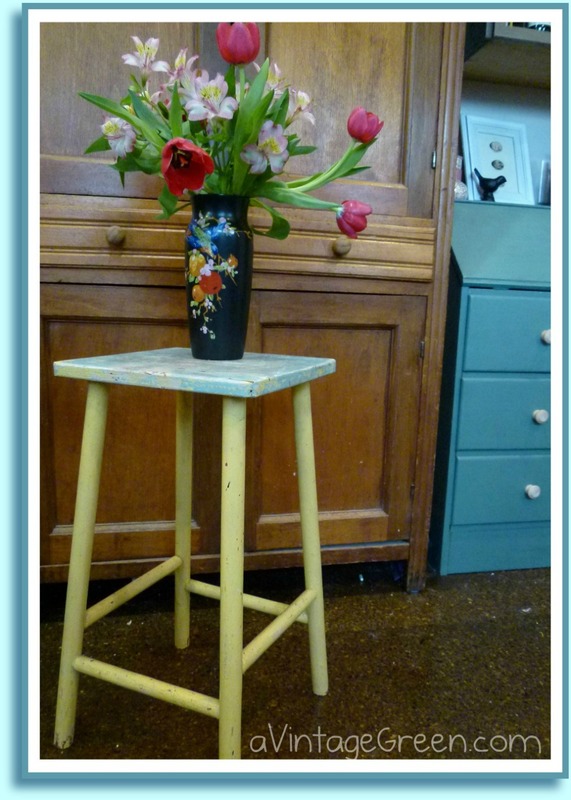 I added a drop shadow frame to the picture using PicMonkey. http://www.picmonkey.com It has many of the Picnik features and I've notice drop shadow and caption spaces as something new to me. Does the same easy job with watermarks and text as well as frames. No collages yet but they are working on to get that ready. Doesn't have multiple uploads of pictures for editing (one at a time) so I am emailing them to ask about that feature as well. They are very responsive to the public. I am very happy that PicMonkey a web based (free) editing software as easy to use as Picnik and has many very similar features. I am quoting from my Dad's blog as he wrote about the family rocking chair. In the 1920's: "Furnishing a home in those days was a matter of making what you could out of what was available and ordering the rest from Eaton’s Mail order Catalogue, shipped from Winnipeg. We picked up the parcels in Halkirk on the CPR . 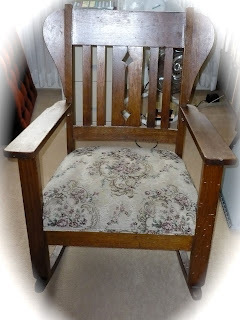 One of the items was a sturdy oak Rocking chair with an upholstered seat. I have been the custodian of that lovely old rocking chair for some time, sharing the honor with our daughter Joy. We no longer rock children in it and in our downsizing we have got to the point in life where we are learning to travel more lightly". My mom nursed and rocked all of her children in this chair - although it had a leatherette seat during those early years. I was the chair's owner for over 30 years and (rebuilt and reupholstered it a few times) have returned it back to Dad when I could no longer fit it in the living room. Dad has been sending family pieces of furniture to family members over the past few years and this chair may be heading home with my oldest brother. 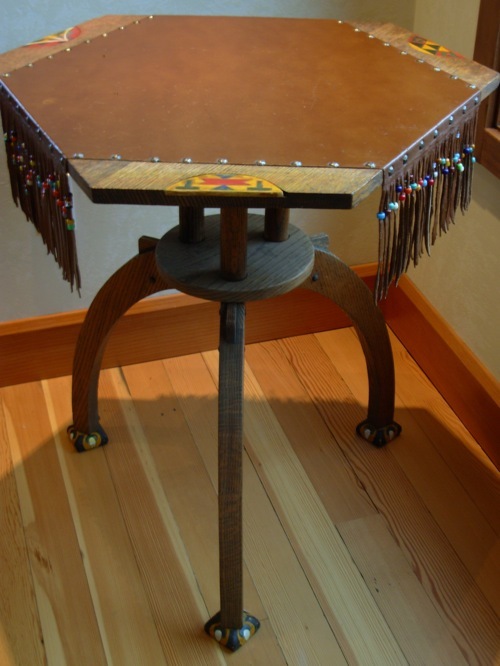 Another piece is an unusual table. My sisters is looking after this sentimental table and the shoe shine stool that Dad made when he was young and she has the couch and chairs, once burgundy (now green) that our parents had from their early married years until they downsized their home after retirement. Care taking and passing forward. Linking memories over time. One commonality among several of the family is the enjoyment we find in writing blogs about our own interests and observations. I would love to have something like any of those that came from my family. Interesting pieces. Nice that you are keeping them in the family...Today I am teaching Princess how to refinish a piece of furniture. We have a Goodwill find that I am gonna "turn her lose on". I hope she enjoys the process as much as I always do. hi Joy ... just love the old family pieces. Lucky brother to get the rocker. That three-legged table is so unusual. Always enjoy your photos and your blog. Thank you for sharing at Potpourri Friday! I always appreciate your participation, Joy!